Hello everyone, Cheryl here with some super CUTE CottageCutz gift Tags. 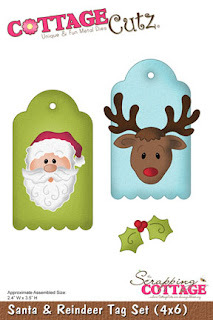 I made these darling tags using CottageCutz Santa & Reindeer Tag Set. For both of my tags, I cut them using white card stock, then airbrushed the tags, with a pink and a purple. Next I colored the Santa and Reindeer using copic markers. I stamped the sentiments in Black ink, and then added some RRRibbon and some buttons to complete these darling gift tags. They are super fun to make!!! What a fun idea. These are so cute Cheryl. I bet they go together pretty fast so that you could do a bunch of them in the afternoon. Great job. Great idea and very cute tags. Cheryl your tags are adorable!